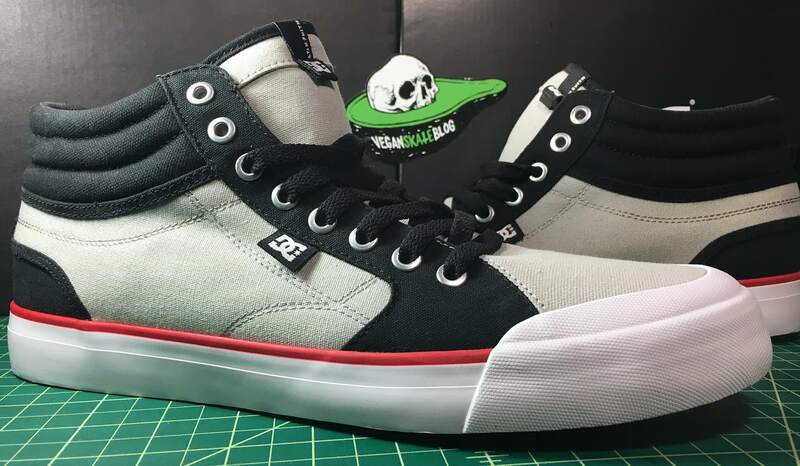 DC Evan Smith Hi is a new vegan skate shoe that dropped in January! We reported on the shoe when it dropped and were lucky enough to have a review pair sent out shortly after. Since we posted in January a new color has been added to the line, navy blue canvas, keeping the line (at least in the hi-top model) totally vegan. The toe-cap has been making the rounds in nearly every skateboard shoe brand. It adds some extra life to the shoe and potentially some blow-out protection. 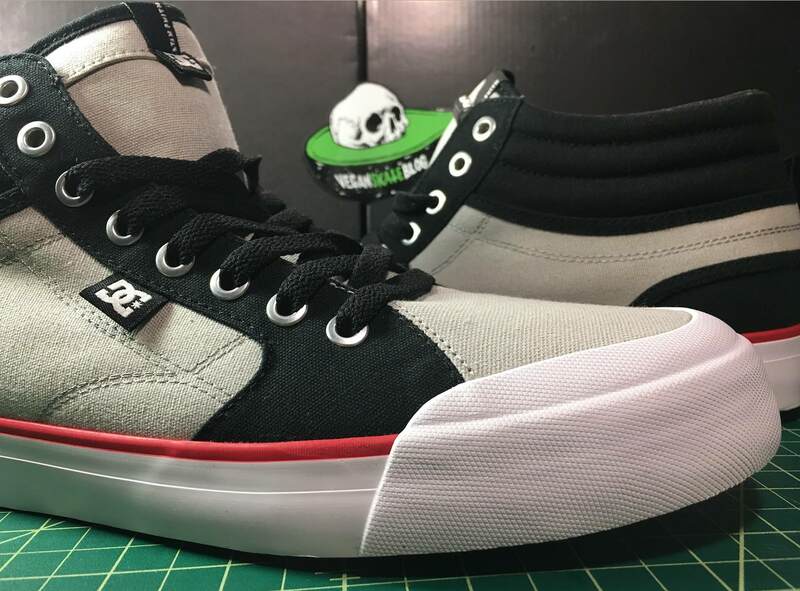 The Evan Smith Hi toe-caps fully wrap the toes but don’t go overboard and they’re not stiff either. This allows for some good toe flex. Looking straight on the shoe looks like it has some heft. When we first tried them out, that was definitely the case. The shoe isn’t overly heavy per say, but it takes some getting used to. That being said, if you have wider feet, the Evan Smith Hi is a good shoe to let your toes spread out. The collar has some light padding and the stitching gives it some unique style that really scream, Vans sk8-Hi. If you’re the type of skater that likes a lot of ankle support, here you go! 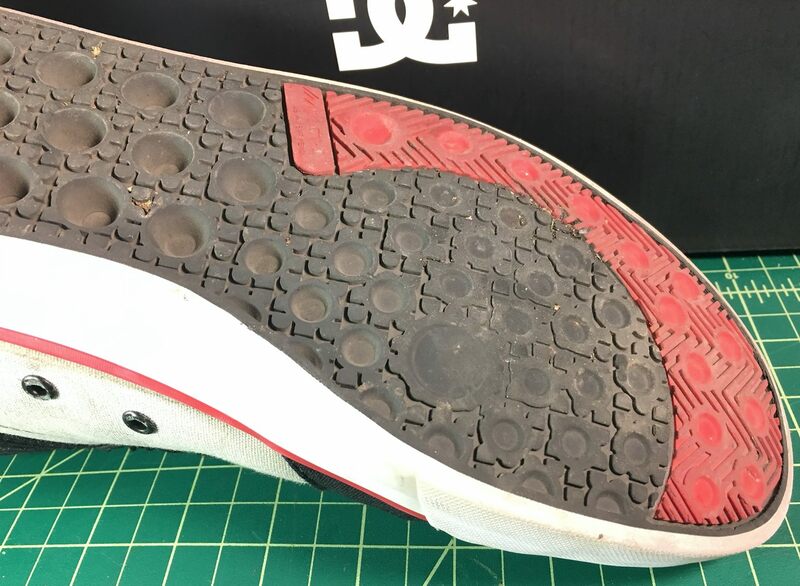 DC’s “Impact-I” sole is one of the new marketing features of the shoe. 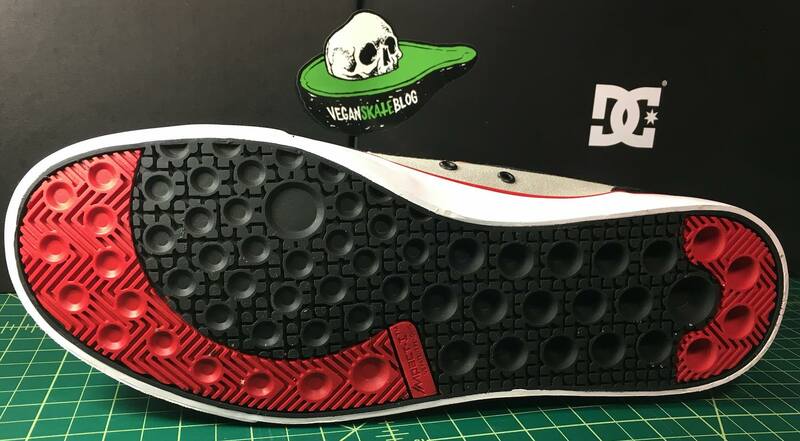 The idea is that the little cone shape cut-outs allow for the rubber to expand on impact, reducing foot pain. Maybe this works, after all Evan Smith can be seen acid dropping off a high overhang of a Pittsburgh convention center in his add for the shoe. 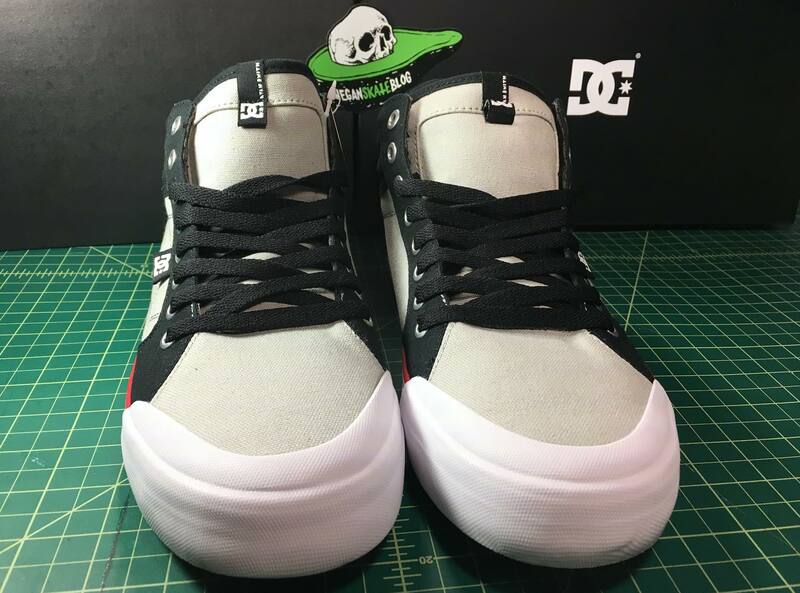 Though for a shoe that already has some heft to it, this is a great way to lighten up the sole, the heaviest element of any skateboard shoe. 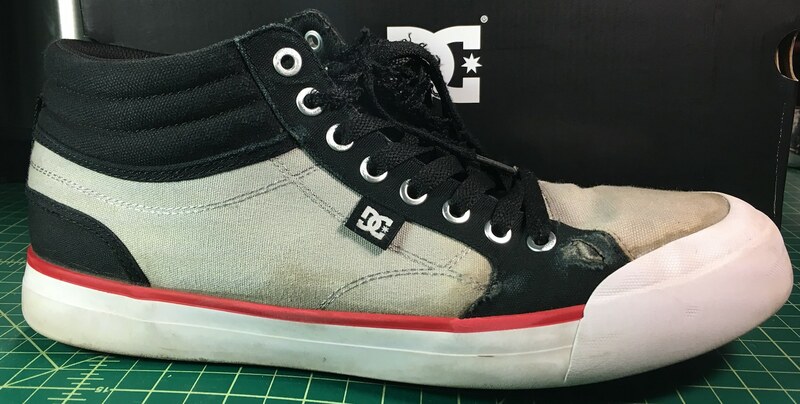 After a weeks worth of skating the Evan Smith Hi, everything is holding up considerably well, though a little discolored around the toe cap and outsole from dissolving glue. Several small spots are developing in the ollie area and the toe-caps are starting to wear down slightly. The laces are a mess on the right side/ heavy wear shoe. They were the first thing to go, but laces are cheap and not as messy as Shoo-Goo. The metal eyelet is always a double edges sword. So much easier to lace up, but a perfect surface to shred laces against. Back down to the business end of the shoe, its nice to see that the black paneling is only wearing down to more canvas. 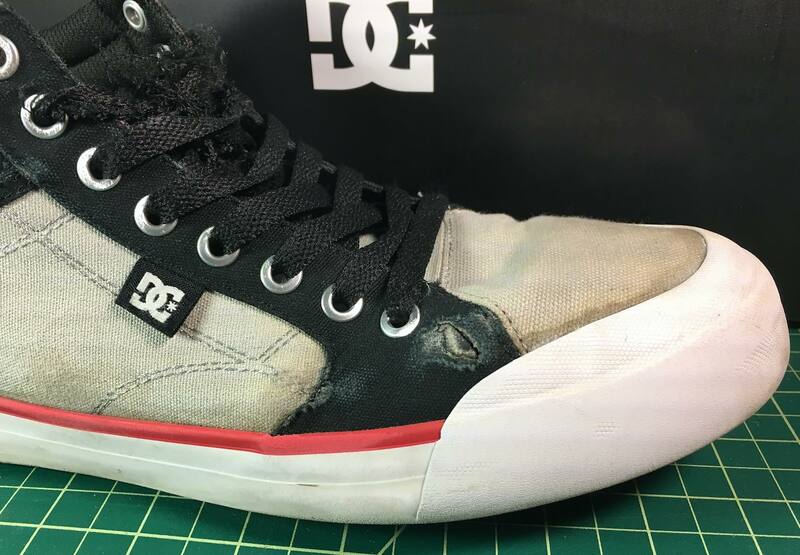 It would be a shame to rip right through that ollie hole while the rest of the shoe has so much life left in it, so it will get plugged with some Shoe-Goo to extended the skate life. 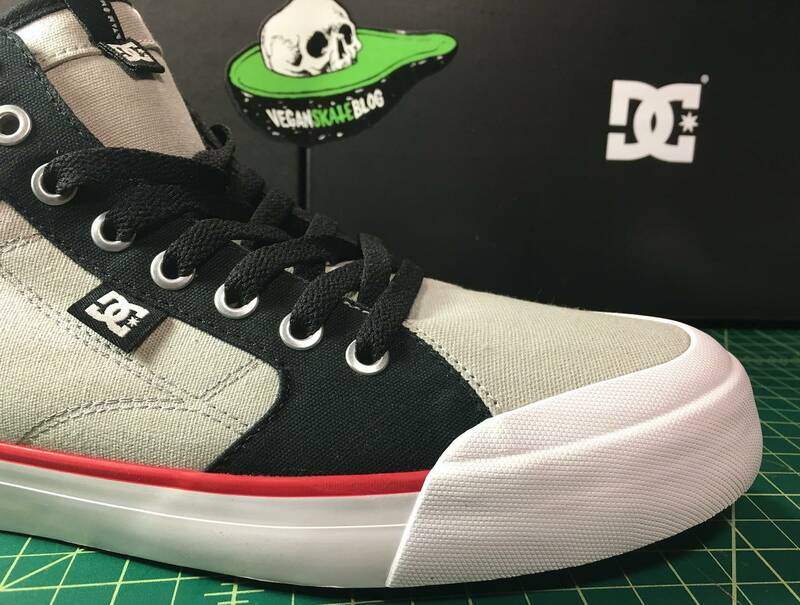 While the Evan Smith might be a little heavier on the foot, it doesn’t look terribly bulky. The heavy wear of the soles happened where you’d expect it, right at the ball of the foot. Those little cones are fading away into oblivion. Further back in the shoe all is intact, but it would be nice to have a little extra rubber up front. The Evan Smith Hi has a toe-cap, multi-paneling, metal eyelets, and some stylish stitching. They lace up and down quickly and feel comfortable from the first wear. They need a little breaking in before feeling really solid on the board. 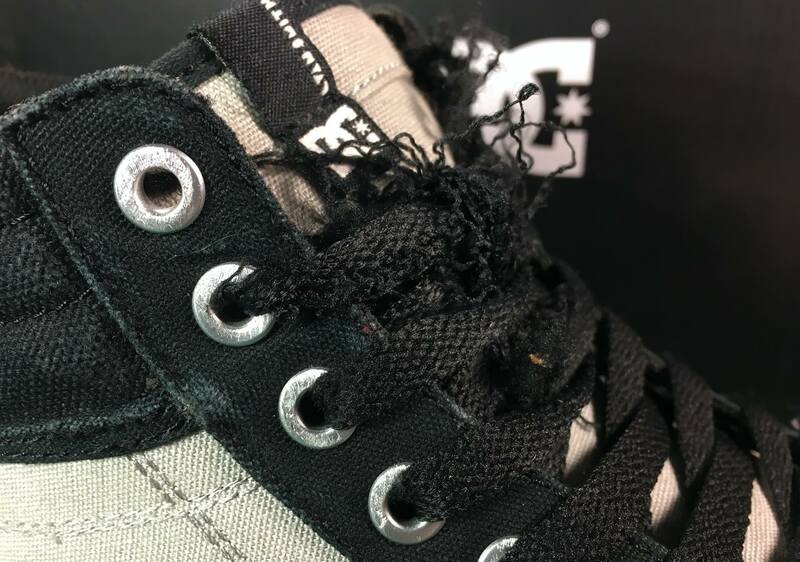 Multiple instances of stumbling, bumping and gripping the grip tape just a few millimeters too soon may happen with any new shoe, especially if you’re not sued to skating with big toe caps. Getting used to that bulky feeling may be a good idea given the extra skate life you may reap. The sizing of the Evan Smith Hi is spot on. The toe is nice and wide, no taper means everything is breathable and loose in the front, no scrunched up toes! 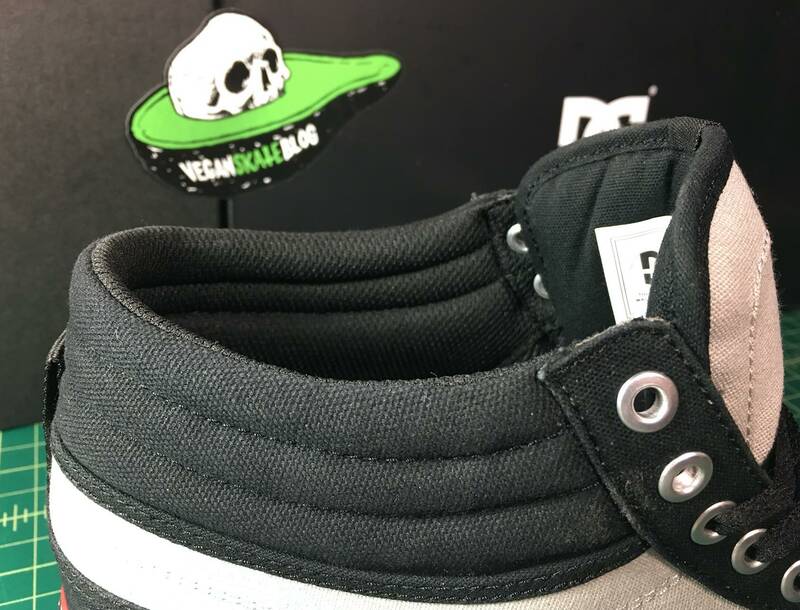 If you’ve been looking for a vegan hi-top with significant skate-ability. Pick up a pair of Evan Smith Hi!